48 Hrs with the new Prusa SL1 SLA Printer! 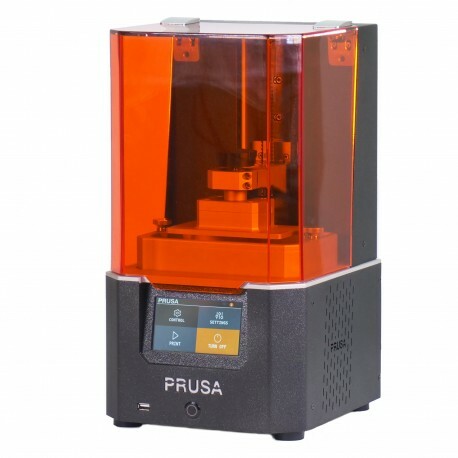 Prusa selected me to beta test the new Prusa SL1 SLA printer and I received it on Monday afternoon (exactly 48 hrs from when I'm writing this). I'll let you read the specs on the web site so I can focus on the beta testing here. I had dabbled in DLP resin printers a few years ago with the SeeMeCNC Droplit printer kit. It was an interesting printer but the slicing and control software was just way too immature at that time. So, in addition to the printer itself, I was very interested to see what Prusa did with the software. 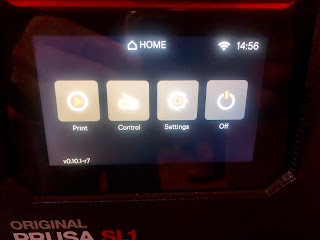 I've frequently commented that one of the big strengths of the Prusa i3 printer's success is due to the phenomenal job Prusa has done seamlessly integrating the firmware, slicer and printer itself. The entire user experience (not to mention quality of results) requires such a holistic approach. I suspected that the SL1 would be similar (and I was correct). Let's start with the unboxing. I received two large boxes. One contained the SL1 and the other contained the optional washing curing station. The Gummy Bears are always well received - and short lived! I started with the unpacking. Everything was well packed and attractive. First impressions are everything and the SL1 and CW1 delivered a great first impression. I was surprised at how heavy the SL1 was - it is mostly aluminum with a big linear rail and ball screw for the Z axis. The CW1 is also well built and contains a stainless washing container and rack. Once set up, I plugged everything in and powered up. The first task was to connect the SL1 to my wifi network. The SL1 has built-in wifi and Ethernet! Connection was simple. The next step was to check for firmware updates. None were available so it was time to move on to calibration. First, a couple of comments about the SL1 Handbook. Prusa gets an A+ for their documentation and this beta handbook is no exception. Sure there were some images missing and some info needed updating (that's what beta testers do you know) but overall it was complete and really well designed documentation. Ok, now on to calibration. I read the Calibration process in the guide and then turned to the machine. The control panel is beautiful - full color, crisp and clear. Sorry for the poor photos but it is tricky to shoot an LCD display. Let's just say that the colors are clean and crisp. Black background with orange and white text and icons - very professional looking. The Settings button takes you to the calibration procedure. I'll blog more about calibration later but will say it is a quick (5 minute) process and you only have to do it once. The LCD display includes FULL COLOR photos of the actual process - this is really nice. I know some minor changes are in the works for this part of the calibration so I won't post photos here now. 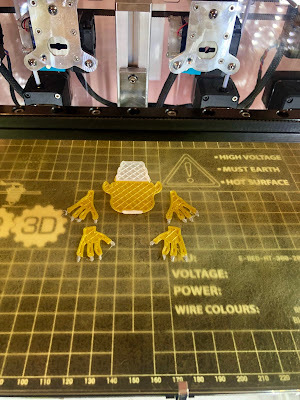 The printer comes loaded with pre-sliced sample models (4 of them) and there is a button to download models - so as Prusa releases more pre-sliced models, it will be a 1-click action to get them. Before jumping into printing I should also add that there is a beautiful web interface to the SL1 too. It looks and works just like the built-in control panel. You point your browser at the printer's hostname or IP address and enter its unique API Key and you are connected. The web interface works great from your iPhone or Android phone too. Under the covers, Prusa has built a custom server with a custom user interface. This should give you a better idea of what the on-board display looks like too. One nice detail - the Web interface makes a gentle "tick" sound when you click a button that sounds just like the on-board panel. Now to the fun part - printing. Prusa included 500ml of "Prusa orange" resin. There was a 1l bottle of red resin in the CW1 box, so I have a little to play with. I'm looking for sublime green resin for 405nm DLP printers so post a comment if you know of anything! Here is one of the included files - a small delicate flower. It is about 20mm across (the petals, the "leaves" are about 35mm). The detail is fantastic and got me excited to do something bigger. At this point I washed the print with a squirt bottle filled with IPA and cured it in the CW1. I don't have enough IPA to wash it in the CW1 - I have 4 gallons of 99% IPA arriving tomorrow though! 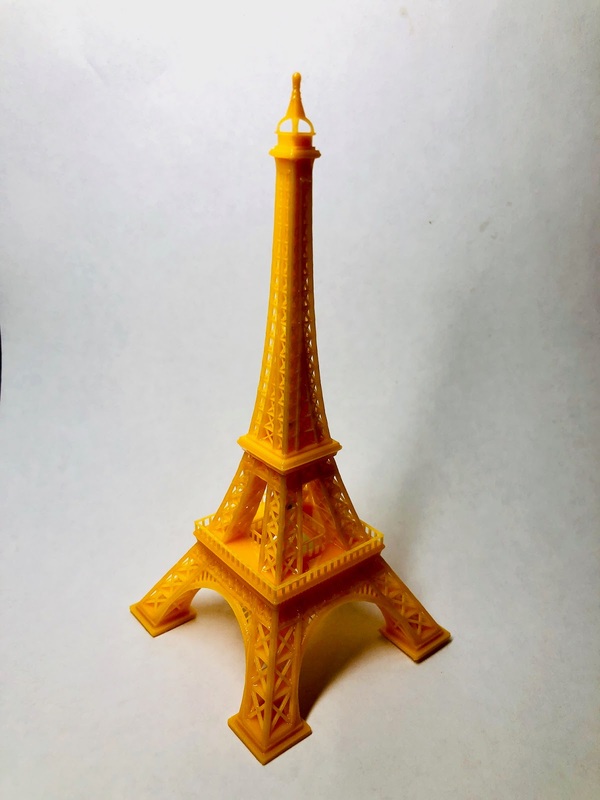 The next print is the infamous Eiffel Tower. It is the standard SLA model everyone must print. This one stands 130mm tall. Again, the resolution is amazing. I was running out of IPA so my washing was not very good. By way of disclaimer I should also say that this print suffered from partial separation of one leg from the build surface. The reason for this has been found and fixed so it won't affect production SL1s. This is why companies do external beta testing and I give Prusa lots of credit to taking the time to do it right. 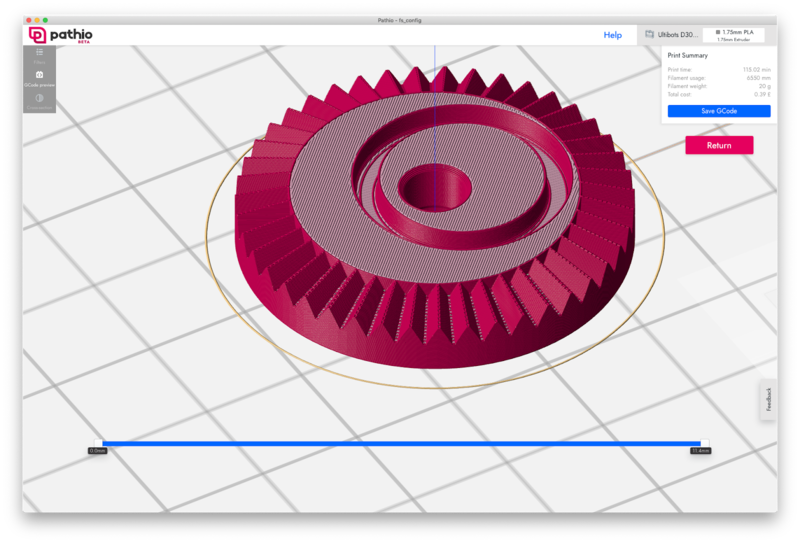 Prusa has added features to the Slic3r Prusa edition to support the SL1 so slicing is straightforward. 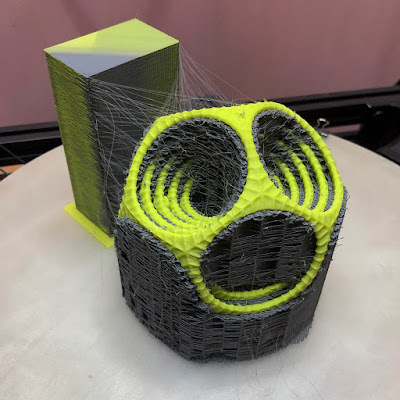 One really nice feature is that Slic3r can connect to the SL1 so you can print directly from it. The SL1 does not require proprietary resins and new resin profiles are being added. 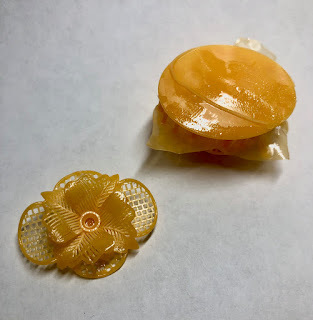 I have some resins on order and will profile those once they arrive. I'll have the SL1 at the Midwest RepRap Festival in Indiana next week so stop by my Sublime Publications booth and take a look. It's official, pathio slicer is in the wild! E3D Online has gone public with their announcement of pathio today - their new slicer written from the ground up as the next generation slicer. I was an early alpha tester and consultant for the project and have watched it come to life - originally code named FishSlice. The pathio team is smart and they have approached pathio development holistically, including a dedicated (and talented) user interface designer as well as some smart engineers. The intent is to be community focused and engage active community members in ways no other slicer before has done. This is exciting news and well needed in the 3D printing world. At this point, pathio is available to the public to download, try and get involved in its development. Today pathio is primarily a beta version but there are some rough edges, so make sure to read the release notes and participate in the new community at https://community.pathio.xyz. Also make sure to read the announcement post above as it really does a good job of describing what pathio is all about and the unique features it will be introducing. 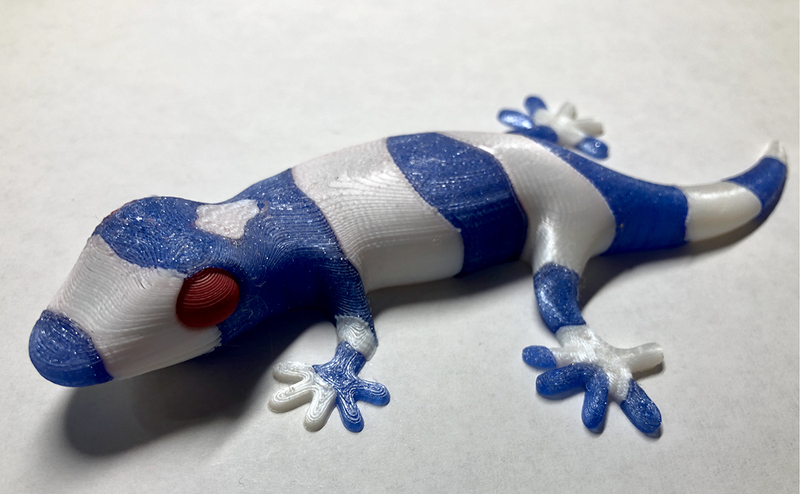 One thing I can say about pathio is that the top surfaces of printed parts are spectacular. I know my way around g-code and I can't tell what magic foo foo dust they've put in there but it works whatever it is. I'll be blogging and YouTubing more over the coming weeks on how to set up pathio and get the most from it while avoiding some of the (temporary) hot spots. So jump in and give it a try and let the community know what you think. Here are some photos of one of my parts on the platter and sliced. Capricorn tubing - not the greatest thing since all-metal hot ends! I'm continuing to commission and complete the details on my E3D tool changer printer. Over the weekend I calibrated all four tools (hot ends) for Z offset. In the process I printed a small part with each tool. I was aghast at the horrible parts I was observing. On all four tools yet. Something was not right. Was it a slicing issue? A firmware issue? Something wrong in setting up the tools? The problem looked like typical filament starvation (usually due to an improperly set up extruder or hot end) with visible gaps in the perimeters and missing sections of infill. I know my slicers inside and out so after making sure I wasn't doing anything odd (KISSlicer) I was confident these artifacts weren't due to a slicing issue. I then thought maybe a bad configuration for filament advance in RepRapFirmware might be the culprit. The config.g was provided by E3D and has required some tweaking by us beta testers. But, after going through config.g with a fine tooth comb, I found nothing wrong. 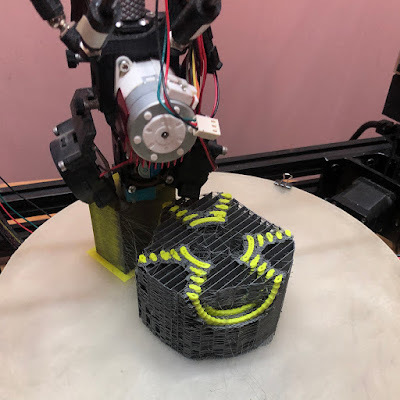 The extruders are Bondtech BMGs and one of them has had some limited service, so I was very confident in it. There is virtually no way to misconfigure a BMG. The tools are E3D V6s. I've worked with E3D all metal hot ends since the v4 days and know how to set one up properly. Even so, maybe I might accidentally mess up one, but all four? Not a chance. So, I followed my own advice and slowed things down and printed at 20mm/s while I carefully observed. The problem persisted at slow speed and I noticed that the filament "starving" happened at the start of a new segment after a previous one ended - i.e. it might be retract related. Retract was configured to .5mm for these test prints, that shouldn't be an issue. Once going, the filament flowed freely. I scratched my head on this one. I took a hot end apart and tested by hand pushing filament - it was smooth as silk. I then removed the lever and spring from the Bondtech BMG and pushed filament through it, again smooth. Then I pushed filament through the bondtech up the 800mm of Capricorn tubing. That's when I felt a fair amount of resistance. With nothing else noticeably different, I swapped the Capricorn for normal PTFE tubing and the problem went away! I've done 2 tools now and tried 3 different filaments before and after and the problem IS the Capricorn tubing. Here are some photos. This part printed with Capricorn was one of the better ones but it had large areas of missing infill and perimeter gaps. The ONLY difference between these two prints is Capricorn vs generic 2mm ID PTFE tubing for the Bowden. So I'm sitting on ~4 meters of Capricorn that is going into the rubbish. Can PTFE be recycled? A print showing color bleed of red into the pearl white. Yuck! Much better! Read on to learn how to get results like this. I've been having a lot of fun with my Palette 2 over the last few months. By way of disclaimer, Mosaic gave me a P2 as a thank you for being a product tester over the last year or so. But, free or not, if a product doesn't live up to my high demands (and expectations) I will not endorse or promote it. The P2 is a remarkable machine, completely redesigned from its predecessor, and capable of producing outstanding prints. However, like all things in life, a little understanding will go a long way to get the best results. One problem that new owners complain about - and usually mischaracterize as a splice calibration error - is color bleed. Splice calibration errors result in pure color being printed in the wrong place. That light pink is not the same as the pure red in the eye. It is color bleed and really doesn't have much to do with the P2 at all - except that you can minimize or prevent it if you understand what causes it and do some quick experiments to refine transition tower tuning in Chroma or CANVAS (I highly recommend CANVAS - it is both a slicer and the Palette's magic software). This post will walk you through the color bleed tuning I've developed to achieve results like the second photo. First, some comments about why bleed happens. The simple answer is "we don't know exactly why it happens"! 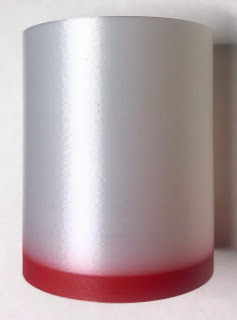 Bleed is not unique to Palette - it also affects multiple extrusion hot ends that merge two or more filaments through a single nozzle orifice like the E3D Cyclops. Practically speaking, the outgoing filament is not being completely purged by the incoming filament. That's the simple part to understand and adjust in Palette (or even Cyclops). However, some filaments seem to find hiding places somewhere in the hot end from which they bleed out at the most inopportune moments. Years ago I noticed that every once in a great while, a streak of black PLA would creep into a light colored PLA print. 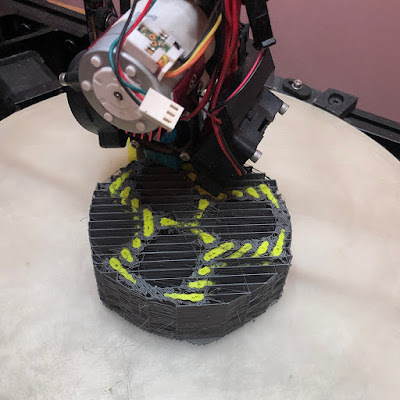 In some cases, I had not printed black PLA for several prints! This black must have found some nook or cranny to hide in. We have some ideas on this but these can not explain all circumstances. More work and experiments are needed to improve our understanding. And through understanding comes superb prints! In general, some types of filament bleed worse than others. ABS does not seem to be prone to a lot of bleeding. It does bleed, but is usually purged cleanly. 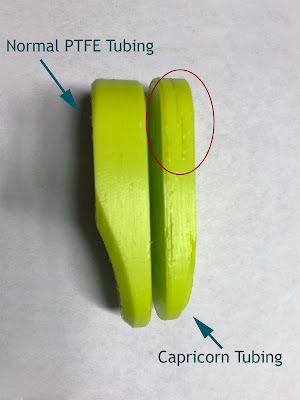 PETG is another one that is not highly prone to bleeding. PLA seems to be the worse of the lot and certain colors like red and black bleed worse than other colors. 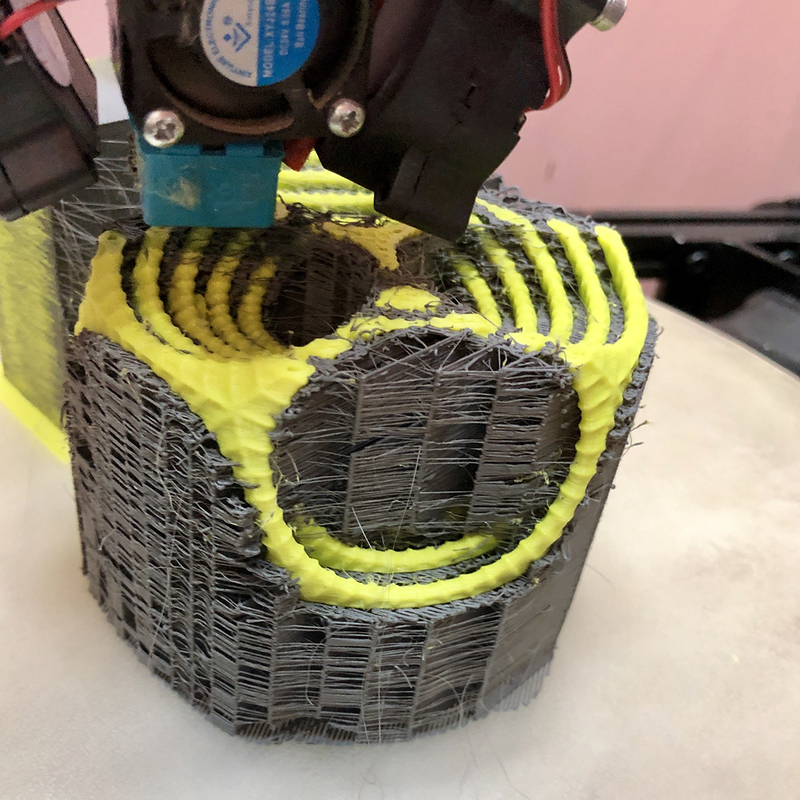 In theory, the new, incoming filament, should push the previous filament out the nozzle without leaving behind any remnants. This must not be happening, otherwise there would be no bleeding. So let's think about what's happing in practice. The filament is smaller diameter than the bore it is being pushed through. Even in the heater block area, the bore is larger than the unmelted filament diameter. The Palette works with 1.75mm (nominal) filament and the bores of most 1.75mm hot ends are actually 2.0mm. This leaves quite a bit of room between solid filament and the inner walls of the extrusion path. Perhaps molten outgoing filament can "circle back" and flow up and fill that space. Retracts - especially long 2mm retracts - might exacerbate the problem by pulling the outgoing filament up and around the cold incoming filament. The length of the melt zone increases the amount of molten filament. The more molten filament there is, the more trouble it can get into like filling voids and pushing up the extrusion path. The extrusion path may have hiding places. Consider the E3D V6 hot end. Its nozzle is tightened up against the end of the heat break. This could leave a little gap - especially if the edge of the bore is chamfered slightly. There may be other hiding places depending on the construction of the hot end. Also, the extrusion path may not be polished or slippery enough to keep molten filament from sticking to it. 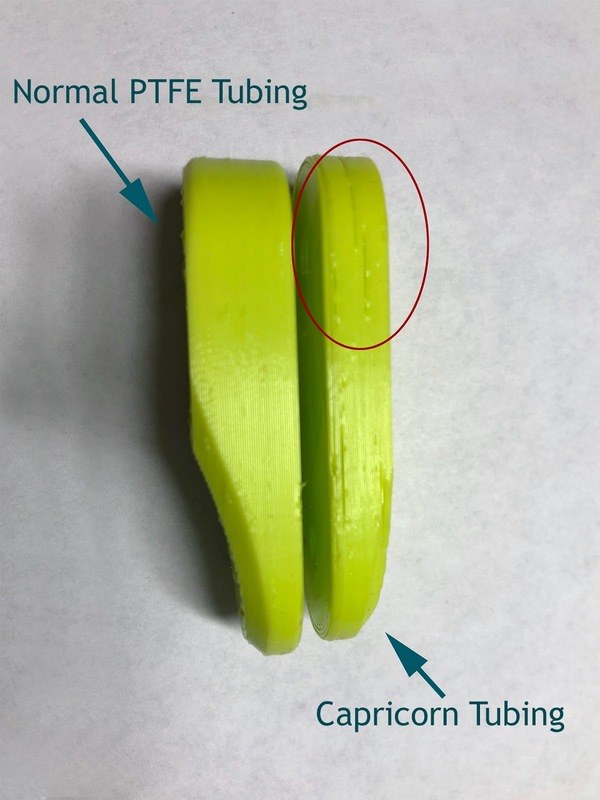 We already have some evidence that Chinese knock-off V6 "style" hot ends are not machined and polished to the same exacting tolerances as a true E3D hot end. Photos of the bore of the heat break looks like the surface of the moon. 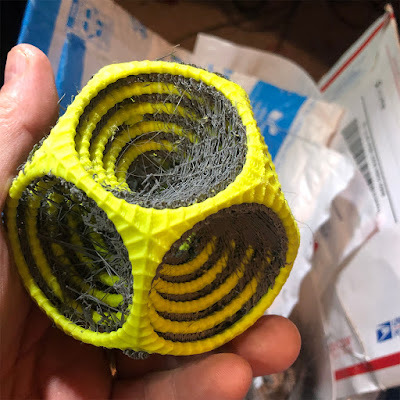 It's easy to imagine filament getting stuck and collecting in all of the grooves and scratches. Here is a close up photo of a Chinese V6 heat break. This photo was taken by Bruce Jenkins (used with permission) and was posted on the Palette Facebook group as part of a conversation on bleed. You can clearly see the annular grooves in the bore waiting to trap and hold molten filament. There are most likely are other contributors too. But let's look at these three categories and try to understand if there is anything we can do to improve the situation. The extrusion path bore must be slightly larger than the filament diameter to accommodate differences in diameter from one filament to the next - or even within the same filament. 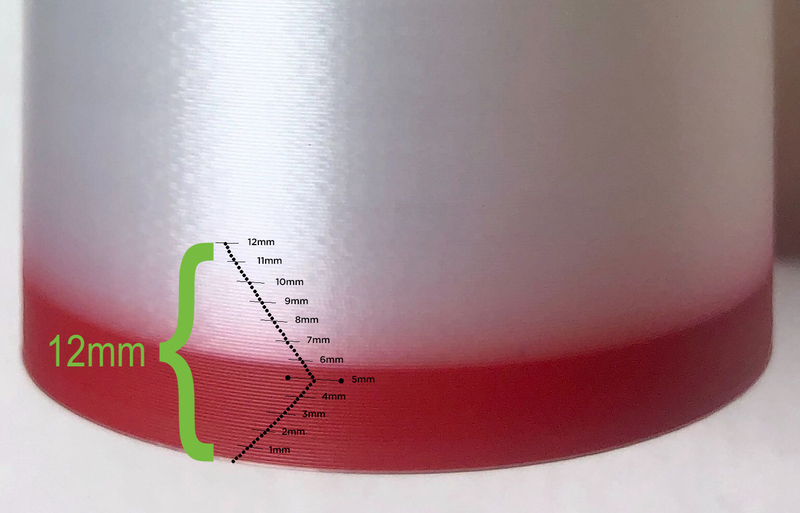 It might be possible to reduce the bore to 1.85mm or so but that would require carefully monitoring your filament to make sure it doesn't cause a problem. Some knowledgeable people have studied this problem in the past and one of them, Jetguy, referred me to some discussion on PTFE lined hot ends like the V6 Lite. The PTFE lining extends all the way to the nozzle and does several things: it's much slipperier than polished metal, it insulates the melt area to more localize the melt zone and as it heats it expands and decreases the inner bore diameter (because the outer diameter is constrained by the metal hot end. I am planning to do some direct comparison tests of V6 vs V6 Lite hot ends to test this. The length of the melt zone is primarily determined by the thickness of the heat block. So, shortening this block could result in less molten filament to bleed. Another contributor to the melt zone is the efficiency of the heat exchanger above the heat block. 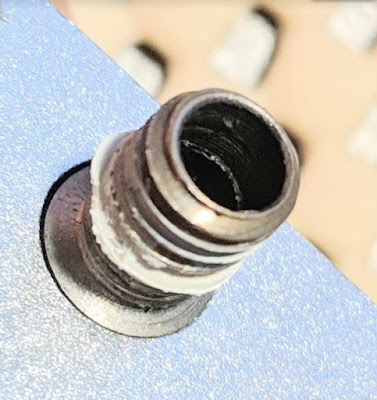 In an all metal hot end like the V6, the heat break helps minimize the flow of heat up into the exchanger but if you've ever had a heat exchanger fan die or disconnect, you'll know first hand that the filament will melt for a cm or more up into the exchanger. So, more efficient exchanger cooling could also minimize bleed. The most efficient cooling is water cooling. I've been an advocate of water cooling for many other reasons but it might also have a positive effect to minimize bleeding. Again, another experiment to conduct! Removing hiding places may be as simple as using a high quality hot end that's been machined and polished to precision or replacing inferior components like a heat break with a quality component. PTFE lined hot ends are certainly smoother than metal hot ends and worth conducting some experiments to see how they perform with respect to bleeding. Now that we have a little better understanding of what causes bleed and some things that might contribute to it, there is still no guarantee that you can completely eliminate it. But don't despair, you can greatly improve your print quality with some simple tuning - color bleed tuning - as described next. And it is best if you follow along using CANVAS. If you prefer to use Chroma and your favorite slicer, you'll have to translate the slicing parameters to your slicer. Load both models into CANVAS and set the bottom part to the darker color and the upper part to the lighter color you want to test. Slice in Vase mode, DO NOT use a transition tower (select No handling). Slice with your standard layer height and extrusion width. Make note of extrusion width you'll need this later. Now, measure the the distance from the bottom of the part to an area where the upper lighter color is clean and not tinted. It is better to over measure a little than under measure. Make note of this height. (the example shows 12mm to very clean white). 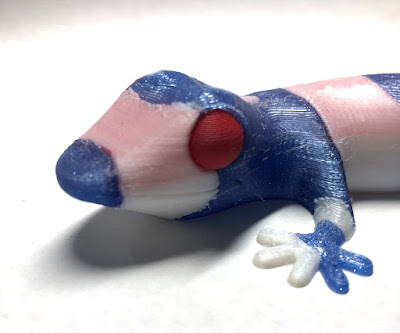 I found that this works great with a 20% transition but you need to have a well calibrated extruder, P2 and ability to precisely start the filament when initiating a print. If you need to maintain a 30% or 40% transition, you will likely need to increase the transition length by 10% or 20%, but this will get you in the ballpark. I am conducting further experiments and also working on studying the effect in various hot ends to test a hypothesis on where the bleeding derives. PLEASE NOTE: this formula has been developed and tested with CANVAS with its integrated slicer. I am doing more research on Chroma and its supported slicers but some Facebook group members have had success with it on Chroma too. The final step is to test your new transition settings by printing the model again, but this time enable the transition tower with your calculated Transition length. Load the model into CANVAS and set the bottom part to the darker color and the upper part to the lighter color. Slice in Vase mode, USE a transition tower (select Transition tower). Set your Transition length to the value calculated above and set Transition target to 20% (or 30% if you must). Slice with your standard layer height and extrusion width. Print the model. The top section should be clean with a crisp separation from the lower dark color. First movement. Now it’s time for first print. All hot end heaters, bed heaters and fans working. No magic smoke released. Sensorless homing on X and Y working perfectly. It’s coming together fast now. I have the good fortune to be one of the early betas (aka Guinea Pig) for E3D's amazing Tool Changer. At its heart, it is a CoreXY with an open front - which eliminates the one issue I have with Core XY format - you can't see it print clearly! This printer is not a "kit" in the sense that not all components are supplied. But the core (no pun intended) of the mechanical printer is included. The X-Y motion platform (Core XY) is fully assembled and ready to go as is the Z axis. 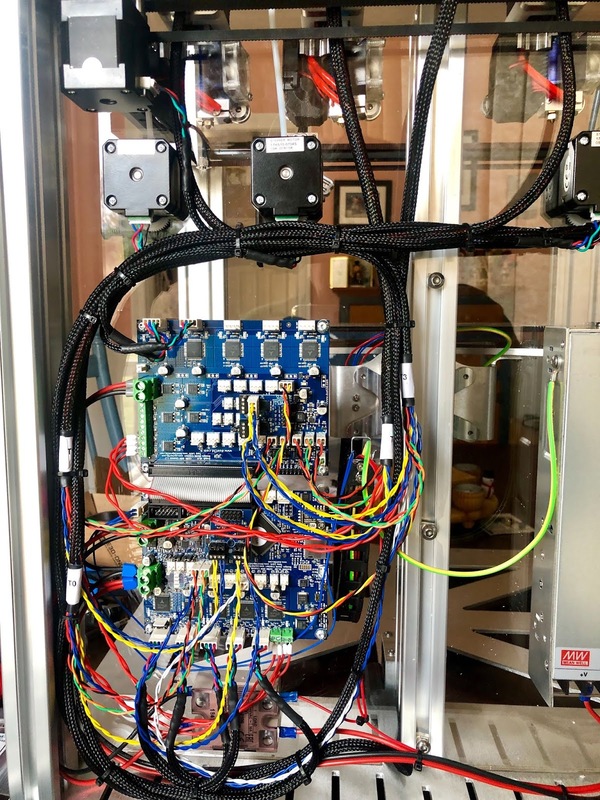 The printer requires 7 stepper drivers so a Duet (Wifi or Ethernet) and a Duex2 or Duex5 board are required. I was the second person to receive the overnight delivery from the UK (the first was in Europe). It came nicely packed in one large box. I got started putting it together immediately. The main printer frame went together in short order. The parts are beautifully machined and fit perfectly. I chose to use four Bondtech BMG extruders (two normal, two mirrored are required) rather than the recommended E3D Titan. That's the only thing I deviated from the recommended build. What can I say. I love Bondtech extruders! 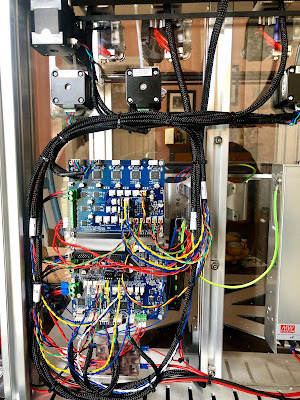 I didn't take a lot of photos of the build as E3D's site linked above has very clear and detailed photos of the printer. I wanted to get this beast built so I could calibrate and start exploring its capabilities. 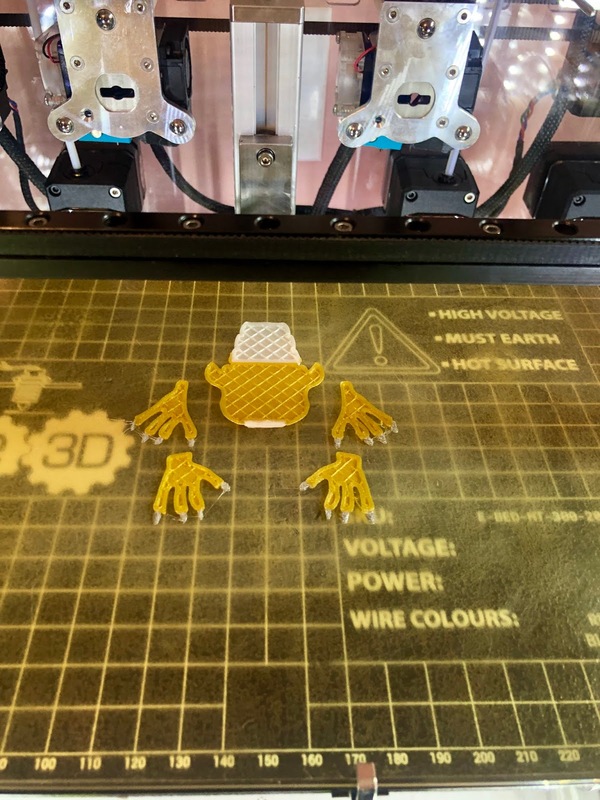 The "most challenging" part of the build was printing the required parts. I used SnoLab's Carbon Fiber PC+ as it is remarkably strong, high temperature resistant and looks fantastic. I did print a few parts in their Sublime Green PLA+. As I write this, I'm waiting for the last part to print that I overlooked. Of course it had to be literally the last step in the build - installing the IEC switch. I forgot to print the housing/bracket for it! It is 30 minutes from completion and then I'll be ready to commission the printer and get to work exploring its capabilities. Stay tuned! This post has a long name to attract attention! I've been quiet for a few months - as I usually am during the last quarter of the year - because that is my crunch time for my EclecticAngler business. But I still do a lot of 3D printing research and printing during this time. Earlier in the year I was selected as one of three alpha and beta testers for the Mosaic Palette 2 and have done a lot of testing, tuning and printing with it. After the beta period, Mosaic gave me a production Palette 2 to enjoy. And enjoy I have! This is my third Palette - I started with the original Palette, then the Palette+. This new P2 is a COMPLETELY redesigned mechanism with an integrated scroll wheel and filament buffer and the amazing Splice Core - the heart of the splicing mechanism. And Mosaic has created a new Cloud service called CANVAS that integrates with their IoT (internet of things) device called Hub. CANVAS includes a slicer - notably, my favorite KISSlicer - and completely revolutionizes the Palette workflow. I'll blog more about the Palette 2, CANVAS and Hub and how to achieve remarkable multi-material and multi-color results from them in the coming months. For now, let's just say I am literally blown away with what the Mosaic team accomplished. I'm well over 7000 splices with myP2 now without a single splice failure. That deserves repeating - over 7000 successful splices without a single failure! Next up, my friends over at SnoLabs have been developing and bringing some remarkable filaments to the 3D printing community. Although they've just started, SnoLabs has made great progress bringing unique, beautiful, functional - and equally as important - affordable, high quality filaments to market. In addition to my now-favorite go-to filament for structural parts, Carbon Fiber - Polycarbonate+ - and including the amazing Sublime Green PLA+. Disclaimer - I do get a small royalty for each spool of Sublime Green to support my work and I greatly appreciate it. That said, what can I say, it is Sublime Green - my favorite color. Thank you SnoLabs! I wanted to find a difficult project to show off the Palette 2 with its ability to splice different materials and Sublime Green PLA+. After a little googling, I came across a model I've known about for some time but never had the tools to attempt - Gyro_the_Dodo_by_Virtox. 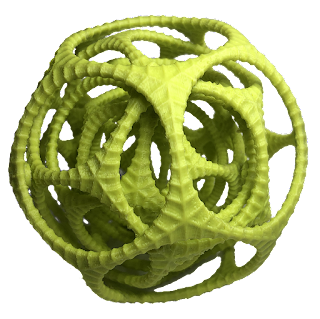 This model is a set of five nested dodecahedrons that independently rotate - all printed as a single print. Complex and persnickety, this model requires a well tuned extruder and printer and a soluble support structure. 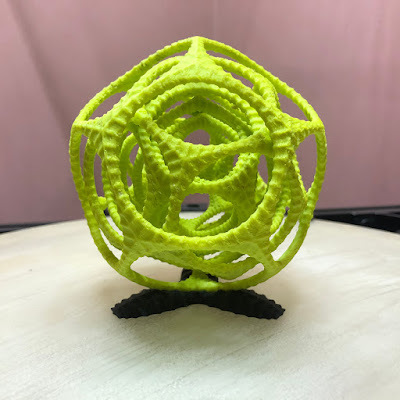 I choose E3D's Scaffold filament for the support. A few quick tests to tune the splices on the Palette 2 ("cover off, 2-0-2") and I was ready to proceed. 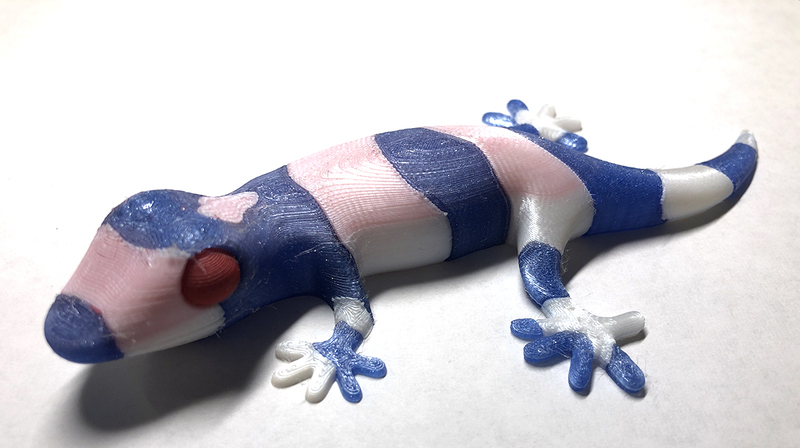 I sliced the model in CANVAS using my basic profile of 3 perimeters, 0.2mm layer height, 0.4mm extrusion width and .6mm top and bottom shells - other parameters are printer-specific. CANVAS automatically talks to your Hub and transfers the necessary g-code and palette-specific files to it. 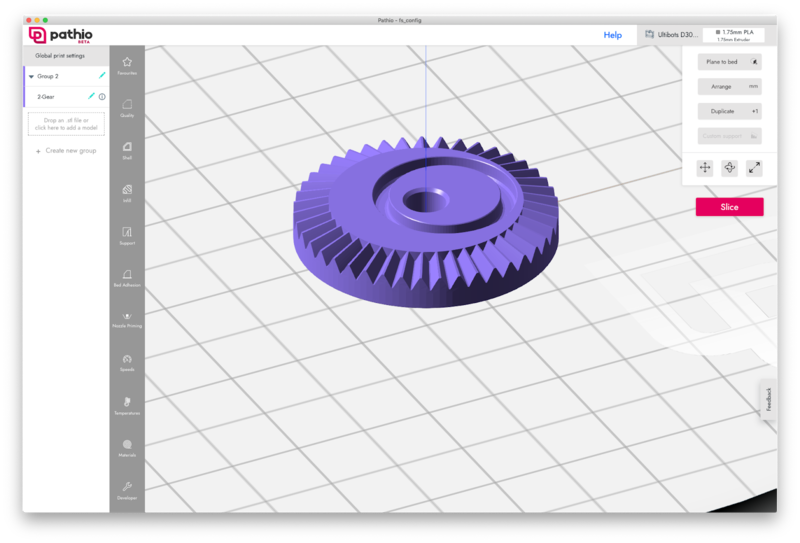 The Hub is Octoprint under the covers with special CANVAS and Palette plug-ins. Once the file has transferred, you print it from Octoprint exactly like you would print any g-code - except that Palette 2 will walk you through initializing and starting the print (more on this in a future video). In the case of this Gyro_the_Dodo, Palette reports 473 splices required. My Palette 2 and printer are well-tuned and I've been playing the "how low can you go" on the transition tower size. This print was created with a remarkable 100mm transition length and 20% transition (I wish CANVAS would let me go below 20%, I think I could easily handle 15%!). and Scaffold makes it easy to see what's going on. About 175 splices in. Things are looking interesting at this point! 300 splices in, it's coming together - literally! of Sublime Green PLA+ and 45.48 of sacrificial Scaffold. Here I've stripped away as much of the Scaffold as possible without risking damaging the part. From here, I soaked the part in one gallon of water for 30 minutes to soften up the Scaffold. I then ran the part under a stream of room temperature water - which washed away most of the surface support and allowed the nested dodecahedrons to pivot. And here is the final product after soaking overnight, rinsing and drying. I also printed a stand in SnoLabs CF PLA (black) to display it on.